The Stud Stasha is an elasticated fabric wristband (similar in appearance to a tennis wristband) which contains a powerful magnet. This magnet will hold four or more studs securely while you are studding up, so that the studs are always in reach yet keeping both hands free. If you do lose a stud in long grass, the magnet can be used like a metal detector to find it again. The wristband is stretchy enough to fit a bare arm or over heavy clothing. Note: Do not use this product if you have a pacemaker fitted. 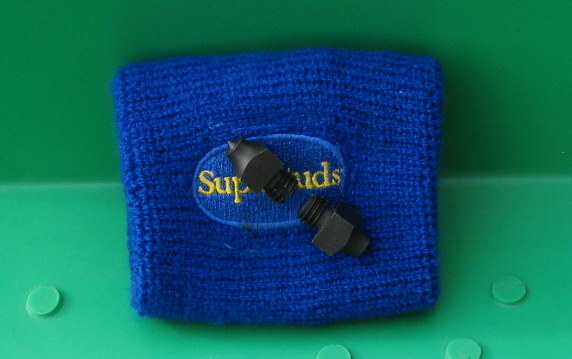 Award-winning SupaStuds have a unique, self-cleaning design which enables them to be screwed into a shoe without previously “tapping-out” the hole. This makes them far faster, easier and safer to insert than conventional studs. A high-tech manufacturing process is used to harden SupaStuds, rendering them tougher than tungsten, and this also makes them rust-resistant, prolonging their life. SupaStuds have been developed in conjunction with, and are endorsed by, top eventers Matt and Marie Ryan. British Team farrier Haydn Price, Olympic Silver medalist Mary King and Show-Jumping Grandmaster David Broome are also supporters. SupaStuds are used by many of the top event riders in the country and have become the studs of choice for thousands of competitors at every level across the board in equestrian sport, from driving to polo, showing to show-jumping. NOTE: SUPASTUDS ARE NOT SELF-TAPPING STUDS, THEY DO NOT RUIN THE THREAD IN YOUR STUD HOLES! THEY ARE SIMPLY DESIGNED TO CLEAN THE HOLE AS THEY SCREW IN, NOT TO RE-THREAD IT. SupaStuds have been designed to make the whole process of studding-up easier, faster and safer. You will still need to remove stones and/or excess dirt from the stud hole, and use a spanner to insert/tighten your studs, but you will no longer need to tap the hole first. 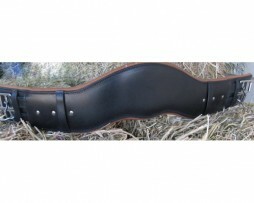 Your farrier needs to make ordinary stud holes in your shoes, threaded as normal with a standard 3/8″ Whitworth thread. If you plug your stud holes, remove your plug by the most appropriate method (this will depend on the type of plug you use. 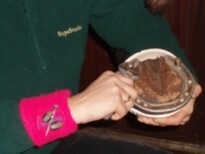 If you do not use plugs, remove the excess dirt and debris from the stud hole using your hoofpick or other preferred method: we find a horseshoe nail works best, but you need to ask your farrier to take the sharp end of the nail off before you use this method, or use a nail that is well worn. Once you have most of the dirt and debris out of the stud hole, simply pick up the SupaStud you want to use and screw it carefully into the stud hole (it goes in clock-wise). Make sure that you are screwing it in with the thread in the hole and that you haven’t “cross-threaded” it – if the stud seems to be going in crookedly take it out and try again. Once you have screwed the stud as far as you can with your fingers (this may not be very far at all, depending on the state of the stud hole!) 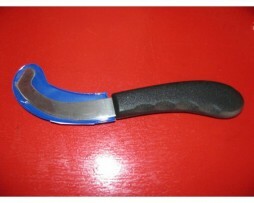 use a spanner to tighten it. You should find that the stud will screw in all the way up to the stud’s shoulder (ie where the flat base of the stud meets the neck). Once you get to this point, give the stud one last quarter turn with the spanner if you can – this locks the stud in place against the shoe and should prevent it from loosening in use. Unless you have used your studs very recently (in the last few days), it usually helps to prepare the stud holes the night before. You can then insert small road studs or travel studs to keep the holes clear, and it will be easy to replace these with your choice of studs for the competition the next day. Make sure you keep your studs clean, with the slot and base clear of mud, as they won’t work properly if these are clogged up. The best thing to do is to clean your studs straight after you take them out, before they go back in your stud kit. Choosing which studs to use is a very personal decision, and we find that, even among the top riders, there is little consensus as to what studs will work best on a particular occasion. We can, however, offer some general guidelines to help you make your own decision. The type of competition/activity being undertaken. Generally speaking, the more pointed studs are designed to be used when the ground is hard and/or slippery, and the square, dome and bullet-shaped studs are designed for use when the going is soft. Some of the studs are a hybrid (for example the Medium Conical (SS004) and Large Conical (SS005)) which are designed to help when the ground is mixed or difficult to gauge – for instance, when there has been recent, heavy rain on top of hard ground (as can be the case in the summer). People generally use either the same studs in the front shoes as behind, or slightly larger ones in the hind shoes – never the other way round. If you use two studs in each shoe, either use the same ones inside and out, or smaller ones on the inside to reduce the risk of your horse catching itself with the stud in the other shoe. A general rule would be that, the smaller the horse/pony, the smaller the studs that are likely to be appropriate to use. The impact of a large stud on a smaller, lighter animal will be more extreme than on a heavier animal, and you need to bear this in mind when selecting studs. Studs that we consider particularly suitable for ponies and small horses would be the Original Road (SS001), Small Conical (SS002), Bullet (SS006), Mini Sharp (SS009), Polo (SS010) and Dressage (SS011). This will also affect your choice of studs to an extent – if you are going to be making very tight turns (such as in a show-jumping jump-off or higher level dressage test) you might go for slightly larger studs than you would use on the same ground for less-demanding activities. Remember, though, that larger studs increase the chance of your horse catching itself with a stud, particularly if you are using them on the inside as well as the outside of the shoe. Also, if you were to fall off and get trodden on, the larger the stud the greater the potential damage! If you are using studs for the first time or are unsure which ones to use, don’t be afraid to ask other riders for their opinion, but remember that it is a personal choice and the final decision is up to you! 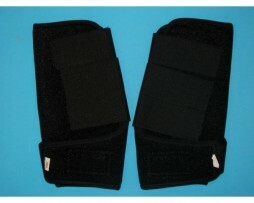 Tendon/Splint boots in colors black or white available in cob and full.